On Father's Day, my son, DIL and Mia came out for a little visit. A few minutes before I knew they would be arriving, I hopped on the gold cart and headed down the gravel road. Planning on giving Mia a ride up to the house, I sat patiently waiting. Believe me, it was all worth it when I saw her little face tickled with excitement as she scampered to unbuckle her booster seat belt and open the car door by herself. Jumping into the cart and scooching next to me, she immediately grabbed onto the hand railing just as I said, "Ready?" And we were off, heading up the gravel road as the dust hid her parents following close behind. Fast forward through bagels, cream cheese, OJ, coffee (for the grown-ups, of course), and the bacon, egg and cheese on hard rolls. "Nana, can we make cookies today? The pink, green and chocolate ones?" "Lets ask your Mom and Dad how long you're staying today first?" After getting a "yes, we have time" from Mom, that is just what we did in between taking rides on the golf cart, making and checking on the little gnome garden. Your not mad at me for not selecting your suggestion, are you? Percy sounds good to me. I love your granddaughter story! Imagine the loving memory you just created with her - bet she'll never forget "Percy," either. Great blog. Percy just sort of hits the spot doesn't it? My mum's dad's name was Percy. 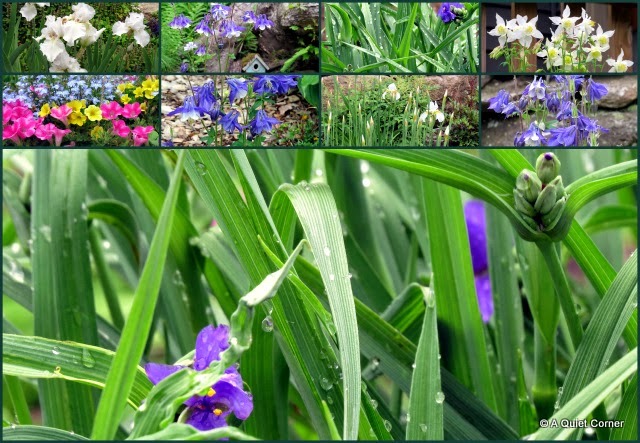 I think the gnome garden is beautiful. I wish I had the imagination that you and others have. 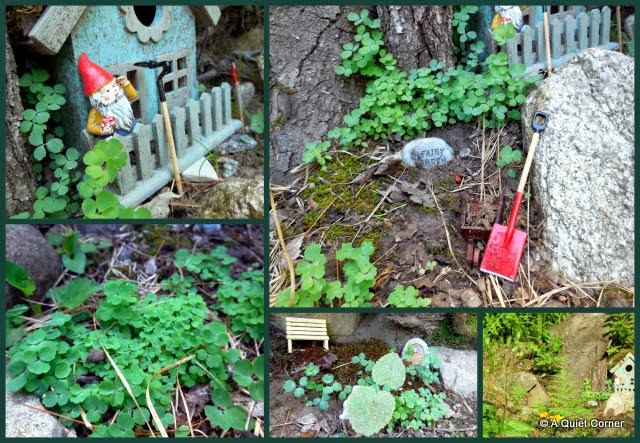 Lovely photos of you gnome garden, and percy is a perfect name! We are constructing a faerie garden, and hoping some faeries will move in soon! No place like gnome! Great shots. Percy is a great name. Good for Mia to think of it. 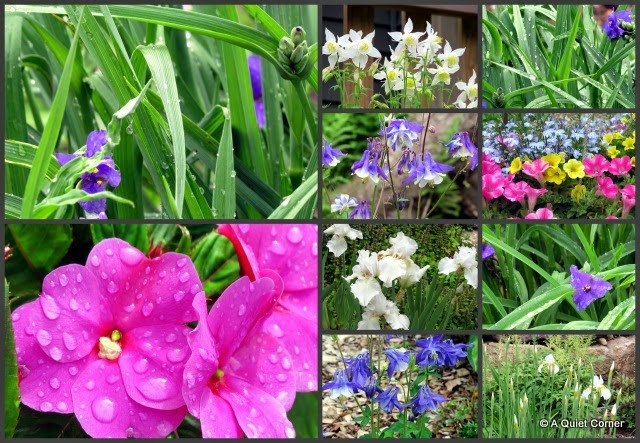 Your flower collages are really beautiful. 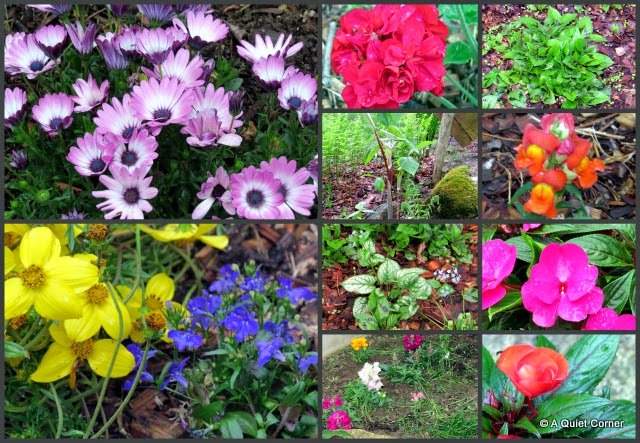 Your flowers are outrageously beautiful! You are one fun grandma, the kind any child would want! I do think Percy is a great gnome name, one you never hear otherwise. Love the tiny red shovel! Well hello Percy. It's a fine name for a gnome. Percy is the perfect name for your gnome.